Health Care Mandate: Tough Sell to Court? The Supreme Court heard two hours of debate today on the key component of the law overhauling the nation's health care that went right to the core of the Affordable Care Act: the mandate that requires just about everyone to have health insurance, starting in 2014. NPR reports that the justices appeared split on whether the federal government can force people to buy health insurance, with the conservatives on the bench appearing especially unmoved by the government's arguments in favor of the mandate. "The government had a hard time, and if they win, they win narrowly," NPR's Nina Totenberg reports from outside the court. "I don't think you can call this." "Three of the conservatives are clearly going to vote to strike it down — that would be justices Scalia, Alito and Thomas," Totenberg says. The law says that if you're not covered by Medicare, Medicaid or insurance provided by your employer, then you'll have to pony up for coverage on your own or pay a fine. Those challenging the law say the federal government is going way too far with the mandate. This, they say, is the first time the government is making people buy a commercial product they may not want. That's a huge overreach, they contend. "The individual mandate rests on a claim of federal power that is both unprecedented and unbounded: the power to compel individuals to engage in commerce in order more effectively to regulate commerce. This asserted power does not exist." 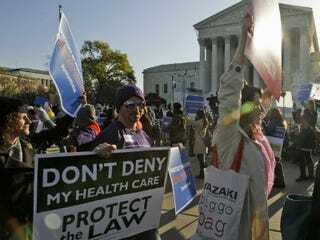 After Clement finished his arguments along those lines, SCOTUSblog's Tom Goldstein left the courtroom to file an update, saying, "The individual mandate is in trouble — significant trouble. It's too early to tell whether it will be struck down." Read more at the Washington Post and NPR.